Happy Mobile Neo 2 Announced! Better Specs At 3,999 Pesos! Home / happy mobile / mobile / news / Happy Mobile Neo 2 Announced! Better Specs At 3,999 Pesos! Happy Mobile just introduced the Neo 2, an upgrade over its predecessor with bigger screen, larger memory, improved battery and better overall performance. Based on the above-mentioned specs, the Happy Mobile Neo 2 is priced quite high. While it's a clear improvement over the old Neo, the specs of this phone still falls short against the competition today. My thoughts might change if they're using a quad core processor, but for now, I'm expecting a price cut. 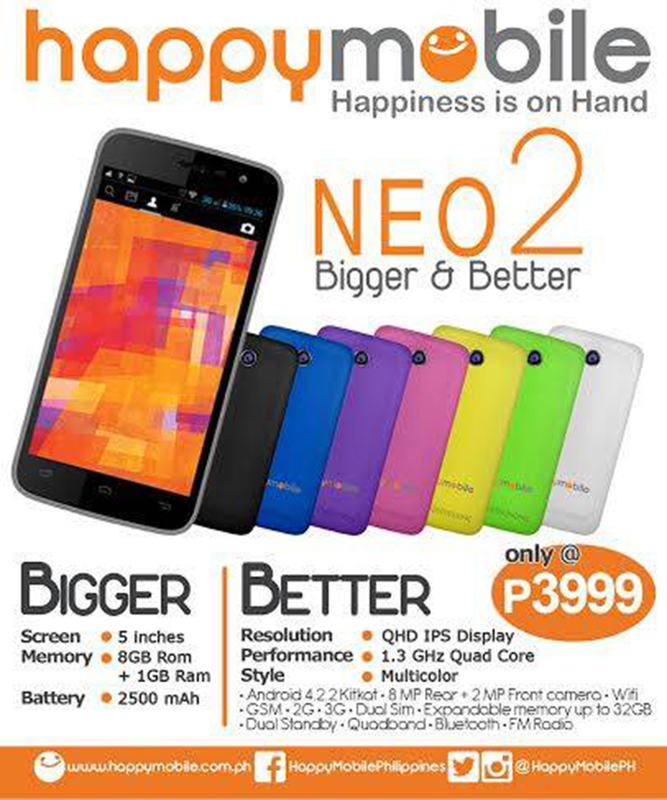 The Happy Mobile Neo 2 is now available in over 300 stores nationwide.